Food requirements: Your puppy will be sent home from Golden Angels Kennels with a small bag of food that he or she has been eating. 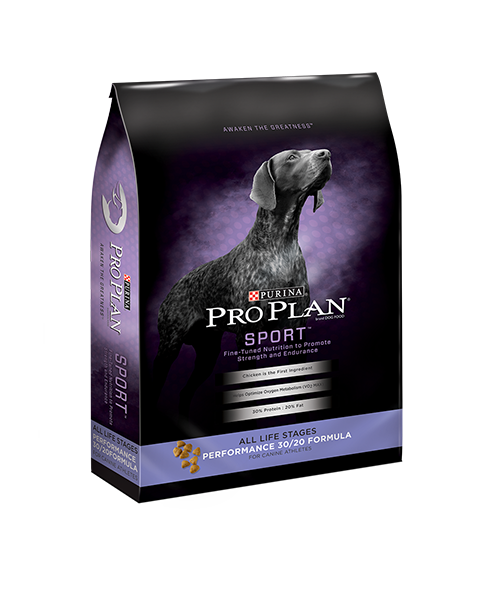 I highly recommend Purina Pro Plan. Feed your puppy 3 times a day while it is young. 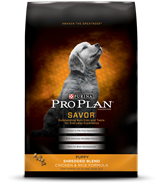 From personal experience, the best dog foods have chicken as the main ingredient and are the best …..just make sure you read the label correctly. 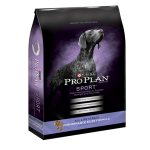 A good puppy food should have over 25% protein. Feeding and Water Bowls: Non skid stainless steel bowls are the best. They rinse clean much easier, do not break and can not be chewed. Next in line I recommend hard, break-resistant plastic. Safe Chew Products, Treats, Toys: Your new puppy will need plenty of chew products and toys. It is the best way to protect the legs of your chairs, shoes etc. When selecting chew bones be sure they can not break into pieces and become lodged in your puppy’s throat. Rawhide bones and rolled up Pig Ears that are made like a long leather strip and wrapped are great and should not splinter. Tug toys, squeak toys and balls can provide hours of play. Kong balls are probably the best ball. They can not puncture a hole in it and tear it into shreds. Squeaker toys can come apart and the squeaker can become a choking hazard. Please use supervision with the smaller toys.When selecting your puppy’s toys take extra precaution as to its dangers. Our dogs are special and deserve treats. 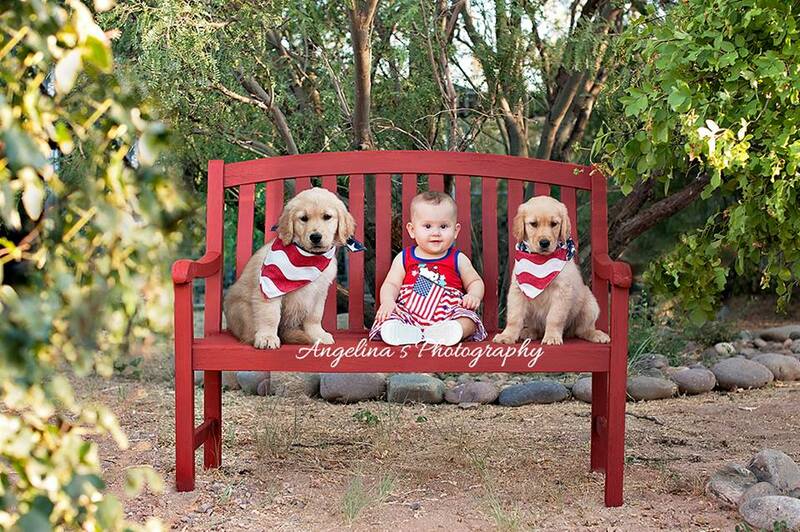 Our dogs and puppies get them every day as rewards for good behavior. You can pick up a package of treats at any local supermarket. Collar and leashes: I do not recommend using choke collars. 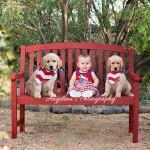 They can injure your puppy! Make sure to check collar often, puppies grow fast! Avoid leashes made of chain. They can easily cause injury and the plastic handles can easily be separated from the chain. 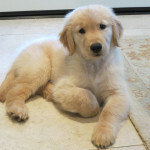 Identity Tags: Your golden will have a microchip placed by our vet. Microchips are the size of a grain of rice. They are placed under the skin in the back of your dog’s neck where it will remain for the rest of his or her life. Register your dogs’ microchip number as soon as you get your puppy home. Tags should have your address and phone number on it. So you can be contacted in the event he is lost or injured. First Aid Kit: ACE Bandage, adhesive tape, alcohol swabs (Do Not use Tylenol or Ibuprofen) Call your vet instead. Grooming Supplies: Dog Shampoo (Do Not Use Human Products on your puppy or dog the PH level is not appropriate for dogs. It will dry and irritate the skin. ), blunt ended scissors, toenail clippers, comb, and brushes. Goldens need to be combed and brushed weekly especially in the spring and fall to remove dead hairs. It also helps keep the skin and coat healthy. Check ears on a weekly basis. 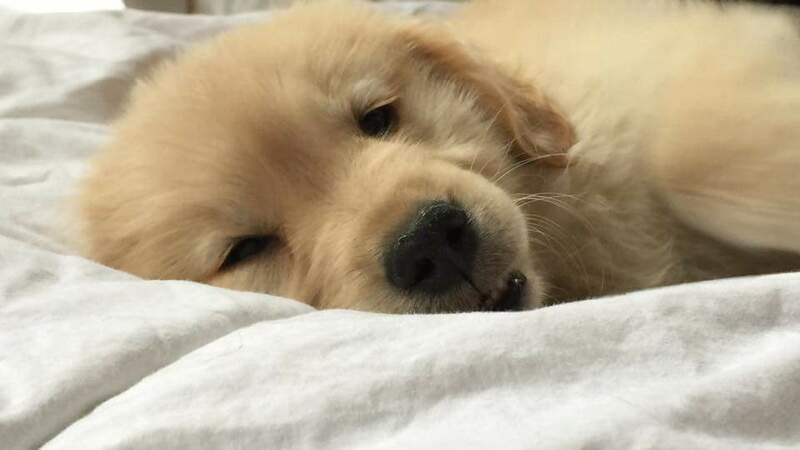 Bed: If you plan to purchase a bed for your puppy, be sure it will be big enough for them to stretch out, soft enough for comfort and most importantly it is washable. Some dogs like to keep their heads elevated, some like the covers and some don’t want a bed at all and prefer the coolness of a hard floor. Ask your pet store if you can bring your pet in and try them out first. Carrying or sleeping crate: A crate is a plastic or metal cage with a door on one end. (The metal crates are not convenient for carrying.) A home inside a home. A place your dog can go to get away from it all. Purchase a crate that will be big enough for your puppy when he is full grown. If you feed your pet inside the crate he will begin to love it. When your pet starts to feel comfortable inside the crate, close the door gradually leaving him or her inside for longer periods of time. Eventually you can confine him when you are out of the house keeping him safe from doggy danger. Never Put Your Golden In the Crate for Punishment! Never leave a young puppy or dog in a crate during your 8 hour work day, it is much too long of time for a puppy to be confined in that small area. Potty Training: We recommend you crate train your puppy. When you arrive home with your puppy, immediately take him outside and praise him or her for eliminating. Crates make house breaking a breeze. Again, Never Put Your Pet In the Crate for Punishment! Never leave a young puppy in a crate for an 8 hour work day, it is much too long a time for any size dog to be confined and a young pup would probably not be able to hold it. Messy crates are not fun to clean. However, if you choose not to use a crate you can confine your puppy to a small room with an easy to clean floor such as a utility room while you are gone. Puppies will not eliminate where they eat and sleep. Put the food and bed on one side of the room, and the puppy will eliminate on the other side. You can lay newspaper or potty training pads on the other side. Beware because sometimes puppies use the newspaper and training pads as toys. Let you puppy out first thing in the morning , after he or she eats, as soon as you return home, and last thing at night. Say “go potty” or whatever command you choose. Eventually the puppy will know what it means and eliminate on demand. Be sure to give plenty of praise and/or treats when your puppy eliminates. Accident Cleaner for the Carpets: Your favorite brand. Most Important, A Veterinarian: If you don’t already have a vet, call around. See if the people are friendly and knowledgeable when they answer the phone and answer questions on the phone without an appointment. Most important, see how their emergencies are handled. Ask your friends and neighbors who they use. You need to be comfortable with your vet and trust his or her decisions just like you do your own doctor. 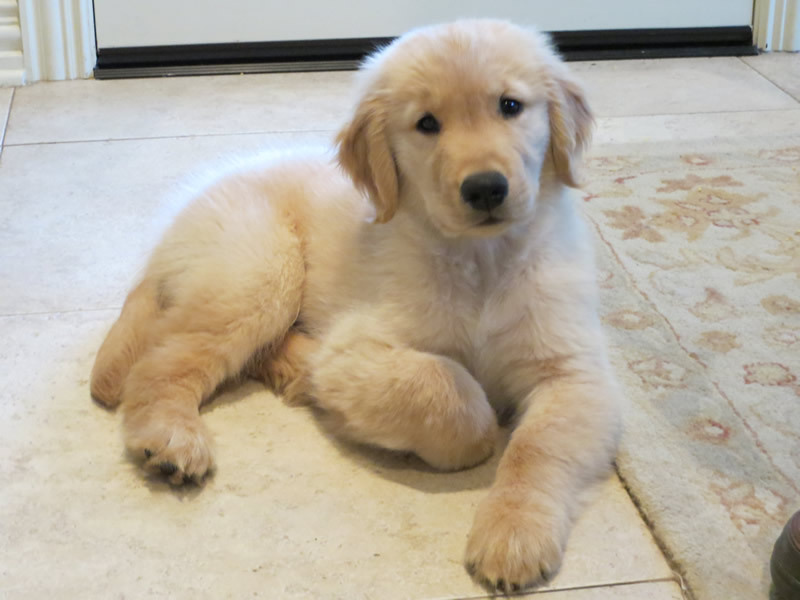 Your puppy should be examined by a veterinarian within 72 hours of arrival. You will need to continue with its vaccinations within a short time. Emergencies happen, and long-term health care is important. Unless abosulutely necessary, do not take your puppy into public places until all vaccinations recommended by your veterinarian have been administered to insure immunity against disease.